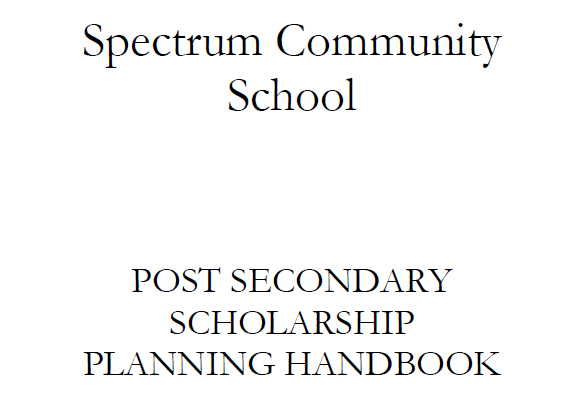 There are 28 District / Authority Scholarships available to Spectrum Students this year. They recognize graduation students for excellence in their chosen area of interest or strength. Winners receive a $1,250 scholarship voucher to use towards their post-secondary tuition. Click the boxes below to find out if you meet the criteria. If you would like to apply, click the APPLICATION BOX. Please see below 12 Scholarship Opportunities!! “There are millions of scholarship dollars offered yearly. The Scholarship Planning Handbook provides a brief overview of information needed to navigate through the process of applying for scholarships. Included in the handbook is a checklist for students to follow when thinking about applying for scholarships. There is a weekly “Scholarship Preparation Newsletter” available to students who are registered in the Scholarship Preparation Course. The newsletter is designed to assist students in their search for scholarships. Here is a sample of what is contained in the newsletter. If a student wishes to sign up for the course they can email Lise Tetrault, Spectrum Counsellor (ltetrault@sd61.bc.ca) requesting to be added to the course. Students registered in the course who attend the bi-weekly class and complete the assignments will earn credits toward graduation.